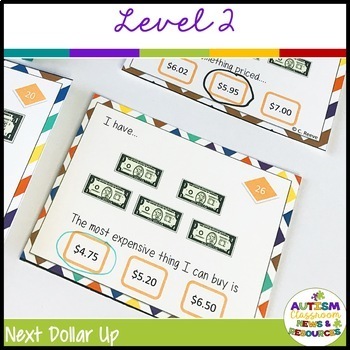 If your students are using The Next Dollar Up method, these cards provide a functional way to to practice using it using real-life situations. 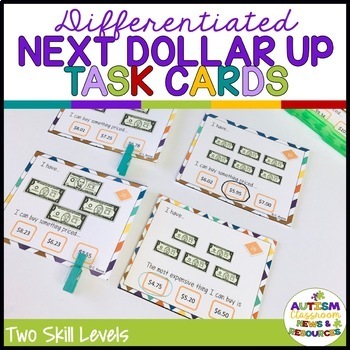 Great for functional curricula students of all ages to meet curriculum or IEP goals. ****NOW AVAILABLE AS PART OF THREE BUNDLES OF RESOURCES AT A REDUCED RATE! 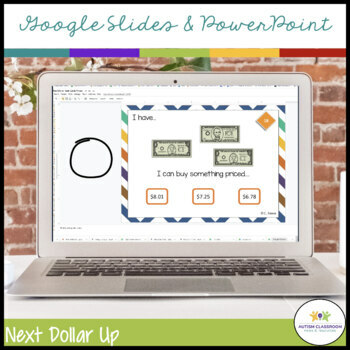 40 multiple-choice task cards for using the next dollar up strategy. Second set of cards (21-40) the students choose the most expensive prices they can buy with the bills they have. So in this set there could be more than 1 answer of what they can buy, but they have to choose the most they could buy. The task cards (1-40) are all multiple-choice with 3 choices so that students can use dry-erase markers to circle the answer and are not required to write the answers. 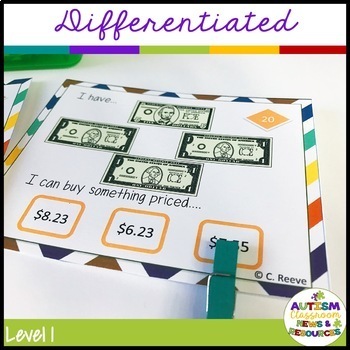 This product is copyrighted to Christine Reeve-Autism Classroom Resources and purchase results in a license for one teacher to use on his or her caseload or classroom. To share with other teachers, please purchase an extra license at 1/2 price.